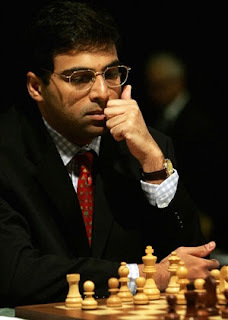 Chesslicious: Vishy Anand turns 40. Wish him! Viswanathan Anand turns 40 today. On the occasion, the chess ace has just one wish -- that the sport be included in the Olympics. "It would be nice to have chess in the Olympics," says the first player to become World champion in all three formats of the game. After all, having won World titles in the Knock-out, Tournament and Match formats, a medal from the Olympics is the only accolade missing from his showcase. The World Championship match against Bulgaria's Veselin Topalov that comes up in April-May is Anand's big event for 2010, and he has already started preparing for it in earnest. As he puts it, the Bulgarian is a "very versatile and dangerous player". Sure, he'll need all the luck and backing from his legion of fans to come out tops. Join us in wishing the king of the 64 squares board a very happy birthday and all the best for the coming year.